Much like the sequel spawned from Evil Dead, a similarly cherished 80s horror, this follow-up to Stuart Gordon’s 1985 bona fide cult classic Re-Animator (it’s jokingly referenced by a stoned Kevin Spacey in American Beauty) isn’t so much a continuation of the first film as a remake of what has come before – the central character having seemingly perished at the end of the previous feature. But unlike Raimi’s second successful crack at his creation, this is a largely uninspired rehash which fails to improve upon the superior original, stuttering along until the demented, anything goes finale. The outlandish ending is undoubtedly what made the film a word-of-mouth hit during the video shop era. Recognising this, Arrow Video have done their best to appease fans which some well-crafted supplementary material focusing on the disturbing and highly imaginative special efforts. These segments prove, almost thirty years later, that physical, in-camera work is still more skin-crawlingly effective than CG wizardry. Like the original, the basis for this one stems from a short story by famous horror writer H. P. Lovecraft. Months on from the carnage he created via his Frankenstein-esque meddling with the dead, Herbert West (the ever game Jeffrey Combs) is still operating beyond the realms of decency and the law. Before you can say abra-cadaver, West and his fellow physician Dan Cain (seasoned soap opera beefcake Bruce Abbott) are back using their florescent fluid to reanimate a collection of various body parts they’ve acquired from the morgue in the hospital where they work. Their experimentations yield some nightmarish results, particularly when West finds a fresh stiff to insert the heart of his colleague’s deceased girlfriend (a casualty from the first film) in a doomed attempt to bring her back to life. Brian Yuzna (taking over the directorial reins from Gordon) won praise a year earlier than Bride of Re-Animator with his wonderfully gloopy gross-out satire Society, but there’s none of that film’s dark transgression or twisted social commentary here. The primary issue is there’s a whole chunk of filler before the eventual scenes of all hell breaking loose and West’s deformed creations turning against him. There’s a crazed detective with a personal vendetta against the duo and a throwaway romantic sub-plot when a pretty Italian associate of Dr Cain pays him a visit with her canine companion in tow (no prizes for guessing what happens to the lovable mutt – suffice to say dog-lovers should stay away). Neither of those secondary characters add much to proceedings, and its clear Yuzna’s interest lay not in storytelling, but rather in showcasing the effects work, which admittedly, is pretty impressive. 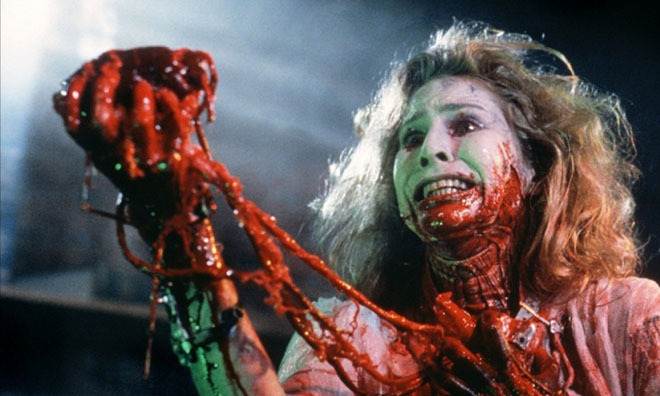 Although he manages to conjure up a certain amount of discomfort around the genuinely disturbing imagery seen towards the end, as a whole, Bride of Re-Animator falls short of the classic B-movie horror its title deliberately evokes.